Whatever I feel like writing about! 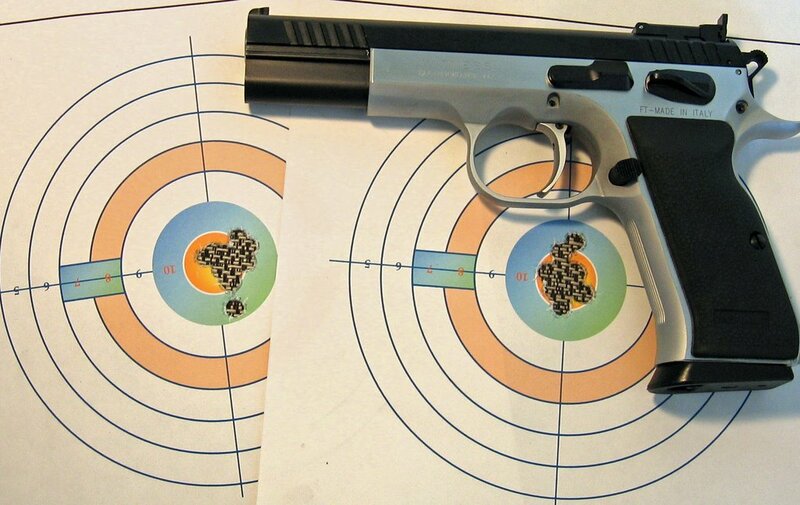 It was the best of guns; it was the worst of guns…and so goes our tale of the EAA Witness pistols reviewed here this week. 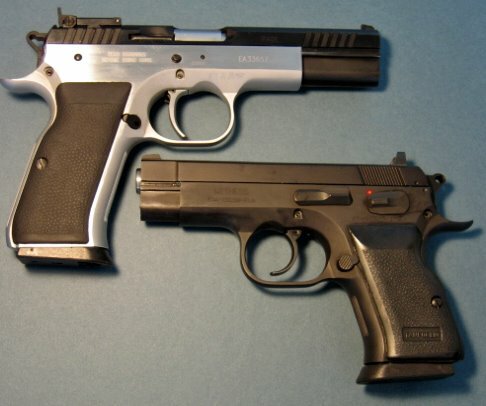 All EAA pistols are manufactured by Tanfoglio of Italy and of these two pistols, the Witness Elite Match in .40 S&W shoots like, well…an elite match pistol and the Compact Witness in 10mm barely shoots. 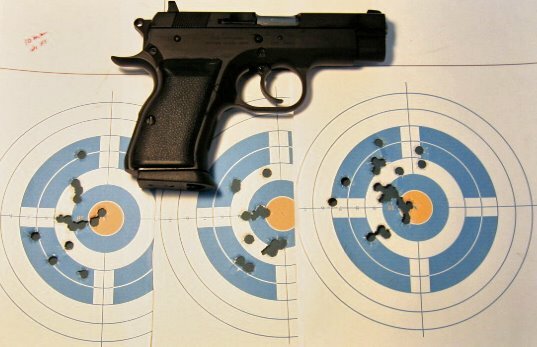 By the end of three range sessions and 300 rounds of ammunition, I began to call it my compact single-shot pistol. We’ll get to all of that in a moment, but first let’s examine the close relationship between the 10mm and .40 S&W cartridge. The 10 mm Auto cartridge was developed by former Marine officer, gun writer and forner proprietor of the Gunsite Ranch Shooting Academy, Jeff Cooper. And, as many of you probably know, Coronel Cooper is the world’s strongest proponent of the Colt 1911 .45 ACP Pistol. He intended the 10mm cartride to be a medium velocity pistol cartridge with greater stopping power than the 9 mm Luger Parabellum and better ballistics (i.e., flatter trajectory, greater range) than the .45 ACP. The Norma Ammunition Company manufactured the cartridge at velocities higher than Cooper intended and the firm of Dornaus & Dixon, developed the first 10mm pistol, the Bren Ten (a strengthened variant of the CZ-75).  The resulting cartridge, introduced in 1983, is very powerful, packing the flat trajectory and high energy of a magnum revolver cartridge into a relatively short rimless cartridge for an automatic pistol. An interesting aside about Jeff Cooper; he never carried a 10mm, preferring to stick with his 1911 in .45 ACP. He must have strongly disagreed with the way the ammunition manufacturers increased the velocity of the cartridge. As far as I know he did not have a dislike of the Bren Ten pistol as it was a CZ-75 clone which was a pistol he respected very highly. In fact, I remember reading his review of the CZ-75 when it first available in the U.S. and he remarked that he liked it except for the puny 9 mm caliber. In fact, he said that if they ever produced one in .45 ACP he would carry it. Well, they did and he didn’t. The 10mm never really gained wide-spread acceptance probably due to a couple of factors. First of all the high velocity cartridge probably had too much recoil for the average user to consider it in a self defense weapon. The second reason was that the Bren Ten pistol was scarce and expensive. The MSRP for a Bren Ten in 1986, the year when production ceased, was $500.00 (which was pretty unreasonable 20 years ago). Also, due to the effects of supply & demand and exposure in the popular media (the Bren Ten was the pistol carried by Sonny Crockett in the TV show Miami Vice), if you found one you paid a quite a bit more than the MSRP (prices of $1500 were not unheard of). The Bren Ten was only manufactured for a few years and when production halted Colt surprised everyone by introducing the Delta Elite pistol which was chambered for the 10mm. Had Colt not produced this gun, the 10mm cartridge would probably have faded into obscurity. In the Spring of 1986 several FBI agents were killed after a gunfight with a pair of robbery suspects they had been tailing. At the time, the FBI had begun issuing S&W 9MM pistols although several of the agent still carried their .357 revolvers loaded with .38 Special ammo. The subsequent autopsies showed that both suspects had been shot several times including hits in areas of the body that should have terminated the fight. The 9mm ammunition was considered a failure and the FBI began looking for something better.Here’s where the relationship between the 10mm and the 40 S&W began. The FBI adopted the S&W model 1076 in 10 mm in the late 1980s and agents began having difficulty handling full-power 10 mm loads causing the FBI to look for a reduced power load. The lower powered loads became known as the "10 Lite", or "10 mm FBI" load but reliability problems ensued when the less powerful loads began having difficulty cycling the pistol’s heavy slide. This lead Smith and Wesson to a revelation as they shortened the length of 10mm, reduced the power, and found they could chamber this round in smaller pistols built on 9mm sized frames. This new round was called the .40 Smith and Wesson. This result has been that this cartridge has become one of the most popular handgun caliber among law enforcement agencies in the US. As I have written before, this is probably the most accurate pistol I have ever owned and completely reliable with every cheap, inexpensive .40 round I could find. The EAA witness is another CZ Clone and the Elite Match model bears a rather striking resemblence to the Bren Ten. The slide to frame fit is excellent, the controls are ergonomically placed, it has a skeletonized hammer, adjustible Bo-Mar type target sights, extended magazine release and a great single-action-only trigger with adjustable overtravel stop. The appearance of he pistol is very pleasing as well, with a beautiful blued slide and controls set against EAA’s “Wonder Finish”. I think it is called the “Wonder Finish” because you wonder what it is: Is it Nickle? Is it Chrome? Is it Stainless Steel? Who knows, it’s apparently Top Secret. Nonetheless I highly recommend this pistol. It cost just a little over four and a half and is a bonafide bargin at that price. The functioning of this pistol is just the opposite of the Elite Match. This pistol was priced at a measly $349.00 so I was not expecting the world out of it and it delivered a “Below Expectation” performance. The gun has 3-white dot fixed sights with the rear being adjustable for windage if you have the appropriate jackhammer to drift the dovetailed sight one way or the other. 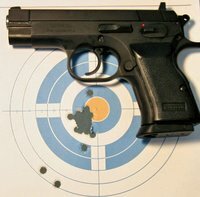 The traditional double action trigger, while not match quality is fine in single action mode. And while the first-shot double action pull defines the concept of “stiff”, the pistol can be carried cocked and locked and fired single action for the first shot. I have taken this gun to the range three times putting a total of 300 rounds through it and although I have not completely written off this pistol I am approaching that mind-set. The finish is some sort of baked on black poly-enamel or it might be Krylon for all I know. Both the manual accompanying the pistol as well as the company’s website is devoid of a lot of information. This pistol shoots low and to the left when I can get a decent group out of it. The gunsmith at Impact Guns has drifted the sights to the right several millimeters and I am still shooting left. I have inquired, via email, to EAA to see if adjustable sights are available for this pistol and I am awaiting their reply. In the meantime the gunsmith recommended filling in the upperhalf of the front sight’s white dot which causes me to move the barrel upward. This has also helped somewhat. However, the main problem is reliability. On the first outing I noticed that 2 rounds out of every magazine jammed. On the second outing I realized that it was always the 8th and 9th round that jammed. On the third outing even more rounds jammed causing me to begin to refer to the pistol as a single shot. This may have some impact on the way the pistol shoots as I have noticed that when the pistol jams, the follow-through of the pistol stops. I am hoping that this is a magazine problem and, as soon as I hear back from EAA on the adjustable sights, I will order a couple of new magazines. I will keep you posted on the results of this pistol’s evolution. All of the stars and planets were in alignment when this target was shot at 21 feet. 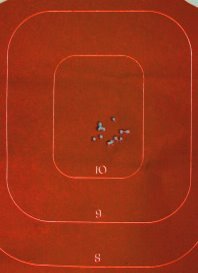 These were rounds 251 through 270 and I would be very happy if I could consistently get this much accuracy out of this pistol, however I was not able to replicate this target again. Most of the 21 foot targets looked like this and while there are some good shots mixed in, there is no consistent grouping. As its name implies, the Bushmaster Carbon Fiber 15 Type 97S features a receiver, buttstock and forend molded of Carbon Fiber. Carbon Fiber is a high tech feather-weight material that offers extreme strength and ultra-light weight. This rifle weighs a mere 4.3 pounds. Also, Carbon 15 material is unaffected by sunlight, water, oxidation or corrosion, and requires only minimal lubrication. The rifle has a fluted, stainless steel, 16" match grade barrel and is fitted with a unique Quick Detach Compensator that supposedly reduces muzzle rise and felt recoil, I say supposedly because I certainly did not remove it to see how the characteristics of the rifle changed. This gun is chambered for the military 5.56mm NATO Cartridge but also accepts the more common .223 Remington. As you can see, the accuracy is good. Admittedly I am not and have never been much of a rifle shooter so this is a new learning experience for me. 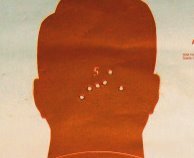 As with handgun shooting, I expect to get better. I just wish that the facility at which I shoot had a longer range for rifles so I could see what this baby is really capable of.